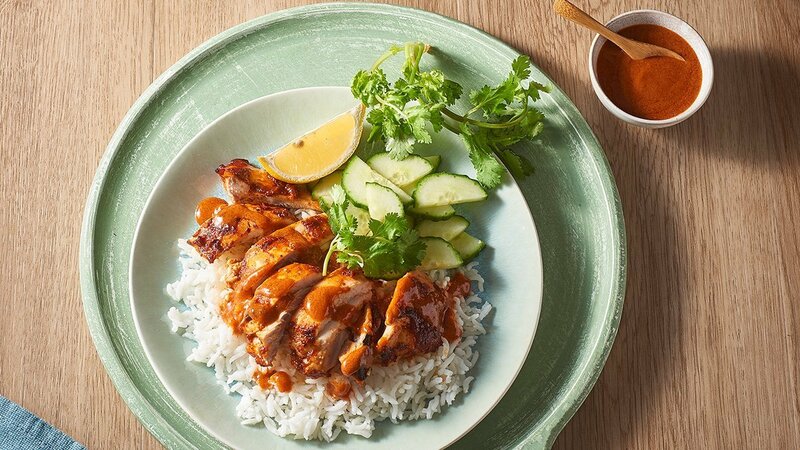 Add variety to your chicken menu items by mixing up the marinades and sauces served alongside. Indian meets Chinese cuisine in this easy to do dish. Preheat the oil in a large pot and lightly sauté the chicken. Add the KNORR Patak’s Tandoori Paste and continue to cook for a further 5 minutes. Add the KNORR Chinese Lemon Sauce GF, KNORR Coconut Milk Powder and water. Simmer until the chicken is cooked through. Cook the Basmati rice in a rice cooker. Serve the chicken curry with the cooked rice, cucumbers and garnish with coriander in a rice cooker.